A stress mark, circled, on my HG Io Frame. You’re relaxing and building Gunpla when it happens. The piece you’ve cut out is red all over—except for a white spot where you cut it out from the sprue. Now you have to live with it. Over the years I’ve learned a lot about these odd white spots, called stress marks, that occur when you build Gunpla. Here’s everything I wish I knew when I started. Stress marks come from pinched, or “stressed” plastic. I used to think that there was a vein of white plastic inside every Gunpla sprue. It turns out that Gunpla parts are all monocolored, they just can turn pale when they’re warped. The white area you see here is a reaction to being cut. Sometimes that happens before you get the kit—maybe it was jostled in the mail and has some slight white streaking where larger parts warped or bent. But usually, stress marks happen while you’re building and you manipulate the plastic with your nippers. Cutting further away from the plastic can reduce stress marks. Have you ever wondered why a lot of Gunpla builders don’t cut close to the piece? Instead they leave some space. My technique goes like this: cut a few millimeters away, then make a second cut (with a God Hand or an X-Acto knife) to fully remove the piece. I end up with a big pile of little plastic beads in the end! Nippers + X-Acto knife = nubs! This is partly to get a clean cut, but it also reduces stress marks. When you do this, the stress mark from pinched plastic is more likely to occur on the sprue instead of the piece. Cutting “backwards” can keep stress marks from appearing. This still leaves a nub, which Milky gets rid of by sanding. Sanding can reduce the appearance of stress marks. Gunpla feet are my problem area when it comes to stress marks. I always get the worse ones there, perhaps because feet are such big parts that they have big connectors to the sprue. But I’ve found that by sanding them down, I can reduce their visibility. Here’s an example of an HG Io Frame kit that I sanded down with some auto sandpaper. The unstressed nub has all but disappeared, and the stressed nub is slightly improved. It’s still pale, sure, but it’s not as much of an eyesore. To make this even less noticeable, I could apply matte top-coat. That would make sure the plastic is no longer reflective, and it would make the sanding scuff marks less visible, too. But the only way to get rid of stress marks completely is to paint. Unfortunately, if you have stress marks on your Gunpla and want to make them disappear, there’s only one way to do it—painting. Painting is a double challenge because if your kit isn’t completely, perfectly sanded and smooth first, your nub marks will be more noticeable. For now, I’ve learned to live with my stress marks. 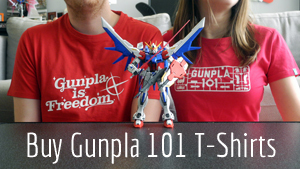 I build Gunpla to relax and my kits aren’t designed for tournaments or contests. If I wanted a completely perfect Gunpla, I would buy a figure or commission a pro like Milky or Ashe to make me one. I hope these techniques help you figure out why stress marks happen and make them occur a little less often but—and I’ve been waiting the entire article to say this—don’t stress about stress marks.